Owen Craft went out that one gloomy day to film possible lightning strikes in the University of Washington area. But what he captured in film was much more than just lightning. 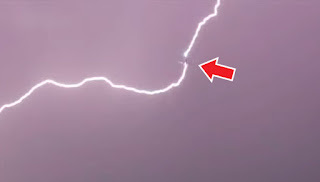 Instead, he was able to film two commercial airplanes getting struck in separate instances by lightning as they arrived in the SeaTac, Washington area. A screenshot from the video where the lightning bolts strikes. What are you doing? Didn't you learn from your friend? What? Did you now see what your friend just... you are... oh my God! Owen said as he watched the second airplane go in the huge, dark clouds. He was sure that it would get hit by lightning too. And it did! Thankfully, airplanes are built to handle lightning strikes as most airplanes' bodies are made of aluminum, which conducts electricity around the shell of the plane without letting it in. And although it was surely scary on their part, the passengers of both airplanes were unharmed.